Right after the outstanding gain Yesterday showcased by Litecoin [LTC] against the US Dollar following the LightningNetwork – CoinGate announcement, the market took a turn and now it is welcoming an all green increasing day throughout the crypto-verse. Second only to the blockchain-pioneer, XRP is differentiating its position further away from Ethereum [ETH] by market capitalization as it has reached the $13.6 bln level today again [ETH – $9.9 bln]. 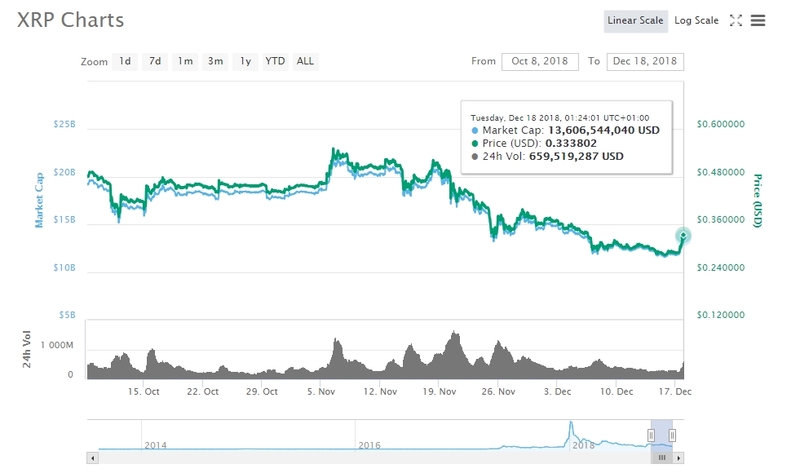 Source: coinmarketcap – According to CMC the pair XRP is appreciating a value gain of 17.30% only in the last day. – Responding to a tweet from one of its users, TD Ameritrade Network commented that they are exploring the possibility of adding support for XRP trading and are actively working to make these kinds of ideas a reality.